Rockler currently has their 4-in-1 screwdriver kit on sale for $5.99 so I grabbed a couple. I needed some screwdrivers for work anyway, and thought this would be a great chance to try turning one myself. 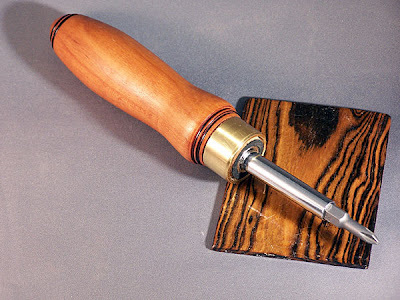 The handle is cherry, and the black lines were done by wire burning, a technique where a stiff piece of steel wire is held in a groove cut into the spinning workpiece. Hold the wire in the groove until it starts to smoke. The hole for the shaft is made with a 5/8 spade bit on my craptastic drill press. The hole isn't perfectly straight, unfortunately. I really need a new drill press! The head of the unit shifts when pressed down into the cut causing an angled hole. The finish is a 3# cut of amber shellac applied over some BLO (boiled linseed oil). I rubbed the shellac into the spinning handle on the lathe. Gave it a wonderful hand rubbed look. If you get a chance, give one of these screwdrivers a try. Lots of fun and useful too!